Owle Bubo isn't an obscure Star Wars bounty hunter. It's a $130 billet aluminum iPhone case, complete with swappable 37mm macro lens. It's well-made, attractive, and makes iPhone video easy. But you probably don't want this one. Products like the Bubo confuse my little retail suggestion brain. For some of you, $130 is a pittance to get a sturdy case with four female tripod mounts, a cold shoe for lights and microphones, and two comfortable handles that steady up your iPhone videography. For others, $130 is nearly the price you paid for the phone itself—or the price of a decent Kodak or Flip video camera. 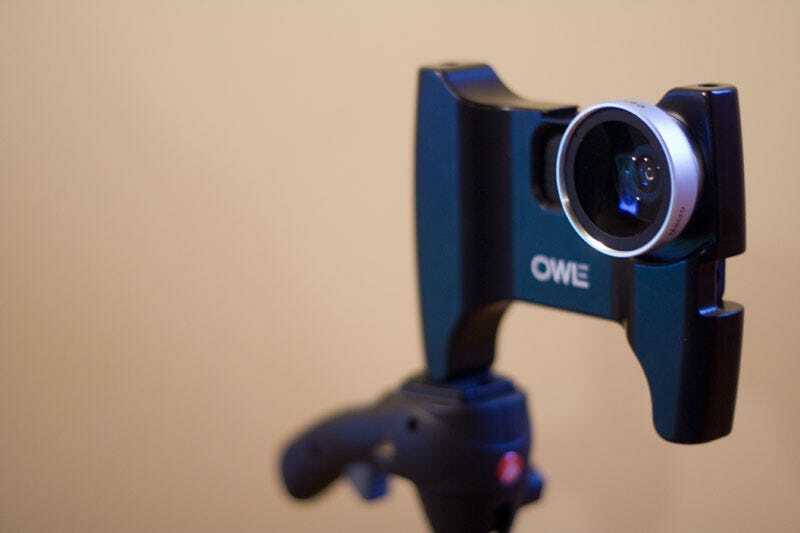 Let's start with what Owle gets right: The design—from packaging, to the physical feel of the Bubo in your hands, to the friendly instruction manual complete with jokes about Perez Hilton)—is excellent, especially considering it's Owle's first product. Video quality is improved over the iPhone 3GS's default, simply by dint of the large glass lens that rests over the iPhone's sensor. It adds a slight fisheye effect, but one that is generally welcome, alleviating the typical claustrophobic feel of iPhone video. But is it over a hundred dollars worth of improvement? Depends. Below I've embedded Owle's video they shot during CES that shows a side-by-side comparison of video with and without the Bubo. Pretty good, right? Well, below are two videos I shot within seconds of each other of a mossy rock and then uploaded straight to Vimeo. Frankly, besides the wider lens and slight difference in sharpness, I'm hard pressed to see anything profoundly different. But a couple of things about the Bubo make me wary to recommend it quite yet. The system for holding the iPhone in place scares me, too. You're forced to put your iPhone in a rubberized case. (One was included with my test sample, but several others from major case manufacturers are supported.) Then you jam that case into the back of the Bubo where it is held in place by tension alone. I never once had an issue where my iPhone started to slip out, but still...it's a bit scary. A simple flip-down tab would go a long way toward appeasing my fear of seeing the heart of my camera system go clattering to the concrete. Finally: price. It's not too expensive for its level of quality—solid hunks of aluminum aren't cheap—but it does take it out of impulse purchase territory for most, which is a pity. A planned composite (read: plastic) version is in the works which Owle expects to sell for around $70. Considering the optics and tripod mounts will still be the same quality as the Bubo's, that seems like a fair price. One final niggle I'd like to see improved in future versions: It would be nice to see a divot in the bottom tripod mounts for stabilizing pins, common on most tripods. That would help prevent the Bubo from potentially spinning itself out of the tripod screw during all-day use.